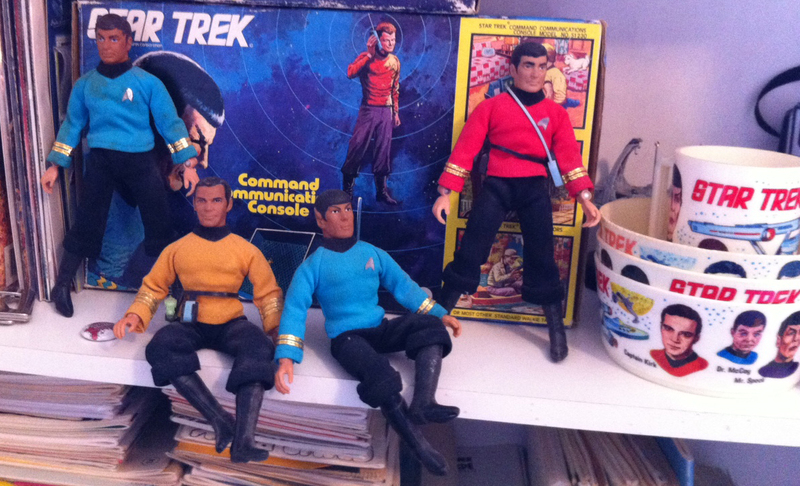 …But I think it all comes down to Star Trek for me, and that’s why I settled on my Mego Star Trek guys. I discovered Star Trek when I was 7 or 8 years old and came home from school to find something on TV wherein a cool cat in a gold shirt was battling a big lizard-man on a distant planet – Kirk vs. the Gorn, obviously, in the episode Arena. Pretty soon I was completely immersed in Trek geekdom, reading the Gold Key comics, staying up late to watch reruns of the show, and jonesing over any and all Trek-related merchandise. 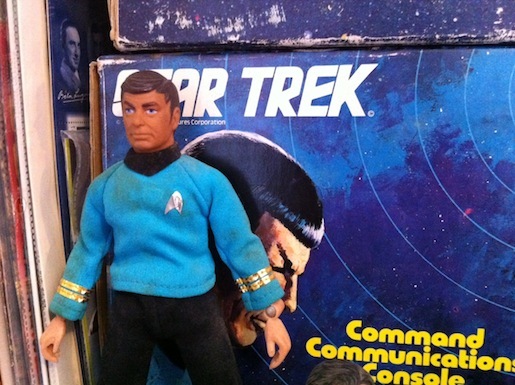 It was around this time that my dad bought a Super-8mm movie camera and projector, which immediately meant that the Mego figures became the coolest Trek toys – not only could you do your own crossovers and have Kirk fight a Soldier Ape, but because they were fully articulated, I could use ‘em to make stop-motion movies. In fact, the very first short film I made was called Space Explorers, featuring Kirk and Spock’s journey to the interior of my house, where they battled our dog (who wasn’t very enthusiastic about being involved, really). 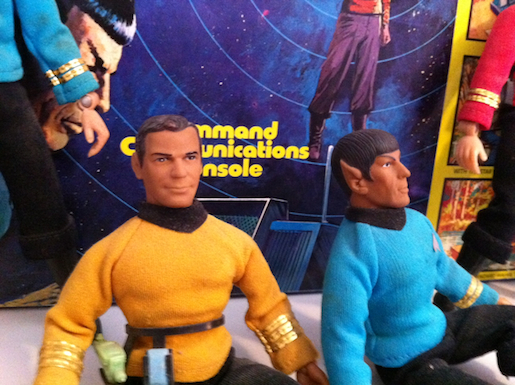 Granted, it was hard to get the figures to stand up on their own, so both of them kinda hobbled around in a bent-over position like withered old men, but still – I was directing Kirk and Spock! Mego released a bunch of Trek figures, Enterprise crewmembers as well as aliens (and those suckers were elusive, let me tell you), but as far as I recall, the only ones I had were Kirk, Spock, and a Klingon, but that was all I really needed. Playing with ‘em in the yard was the best option, of course, but when forced inside due to weather or the potential to be seen by neighbors, the Trek team adventured it up on a weird chair we had – it was all curvy, wide, and covered with shaggy white fur (not unlike the Mugato, now that I think about it). I remember many occasions where Kirk and Spock were forced to climb the back of the chair while the Klingon did his best to bring them down. I used to get yelled at regularly for sticking pins into the chair – but the men needed climbing gear, dammit! The photos accompanying this post are not of the figures I owned as a kid, by the way. Those were all destroyed in terrible space tragedies – well, except for the Klingon, who was mutilated by a giant hamster in another Super-8 epic called Hamkong. I don’t remember how Spock met his end, but Kirk became part of a twisted experiment: wrapped in masking tape, tied to a string, and set on fire, the heroic Captain of the Enterprise found himself swinging around at the end of that string, looking like a half-assed Human Torch until the string burned through and he went flying across the yard. When the flames were extinguished, I peeled away the masking tape to find that Kirk was in perfect shape – except for his head: made from different plastic than his body, Kirk’s noggin had shriveled like a raisin, leaving him hideously deformed, a fate not unlike that of previous Enterprise Captain Christopher Pike, but without the cool wheelchair. 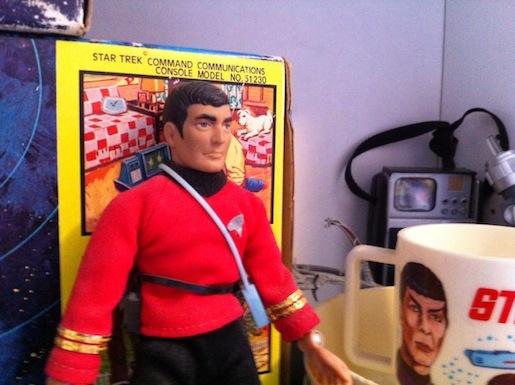 At any rate, the pictures with this post are of replacements I picked up on eBay several years ago – not just Kirk and Spock, but Scotty and McCoy as well. Bones seems to have hip trouble, so he doesn’t stand up well and looks a little cockeyed, not to mention his shirt looks like he threw up on himself after a night of hitting the Romulan ale. I don’t really play with the guys these days (well, not much), but I sure like seeing them on my shelf. I never did figure out what became of my Major Matt Masons. If you’re reading Cheese Magnet, you probably like trashy movies, so please check out my book, Unsafe On Any Screen! Available for Kindle, Nook, iBooks and more, as well as in paperback.